Politics makes for strange bedfellows. But it doesn’t have to. The creators of a new dating app helps singles connect based on politics to help find like-minded matches on hot-button issues like guns, abortion, gay marriage and climate change. So if size (of government) does matter, candiDate is available for free download on the Google Play store with a version for iPhone in the works. A majority of single people in the United States have tried online dating, according to the website Statistic Brain. OK Cupid has 12 million users while Tinder boasts of having 50 million seeking a connection. More than 50 percent of people ages 18-29 are not registered to vote and the digital agency HelpsGood wanted to develop a product that could invigorate young people to get more politically engaged. HelpsGood developers came up with the idea at last year’s Causathon, a 24-hour hackathon competition that challenged attending non-profits to create disruptive technology to get more people to register to vote. HelpsGood won finalist honors with its idea. Since a soft launch on Election Day in November 2014, candiDate has attracted 10,000 users and anticipates a growing following as political movements and campaigns for office ramp up this year. “Even people who say they don’t care about politicos, when you keep scratching beneath the surface, you find they have issues that matter to them,” Bellavia said. 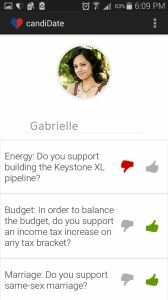 On candiDate, users select “yay” or “nah” on issues ranging from foreign affairs to taxes, education spending and various divisive social issues. The questions are sourced through Vote Smart, which uses a similar questionnaire to help voters prepare to go to the polls. To refine a match, candiDate users will browse voting records of 10 members of the U.S. House or Senate that are close to your answers then swipe left or right. The app uses your votes and swipes to find you the best “candiDate” in your local area. But before you meet Mr. or Ms. Right or Left, the app will present you with an opportunity to register to vote. Whether you’re liberal or libertarian, the app helps find you a political soulmate. The questions can also determine if you’re the type to reach across the aisle. 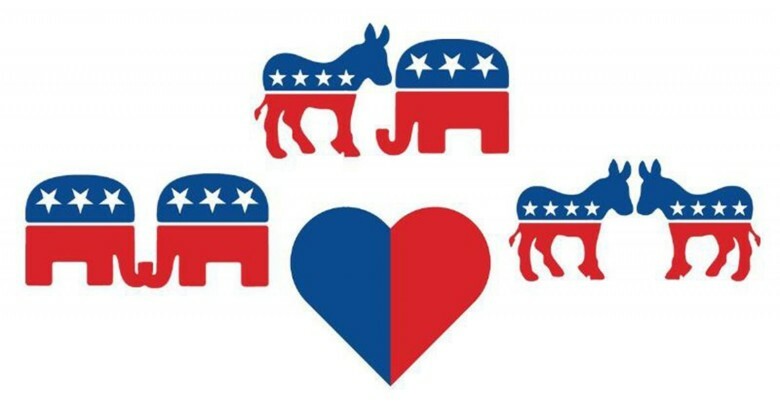 Bipartisan matches are possible. If Republican strategist Mary Matalin and Democratic pit bull James Carville can fall in love and marry, anything’s possible.